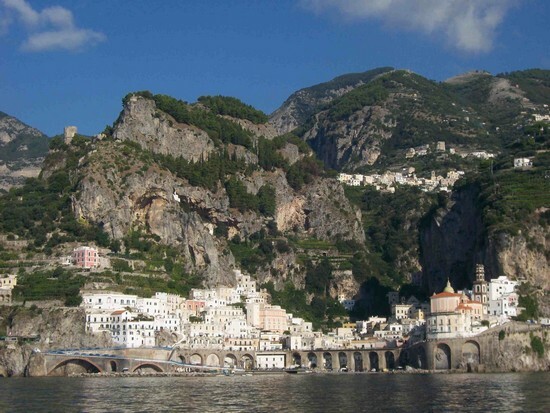 Enjoy a drive along one of Italy’s most beautiful roads, the Amalfi Coast. Located just south of Naples in southern Italy’s Campania region, the Amalfi Coast is famous for the breathtaking views of the mountainous coastline and Mediterranean Sea. 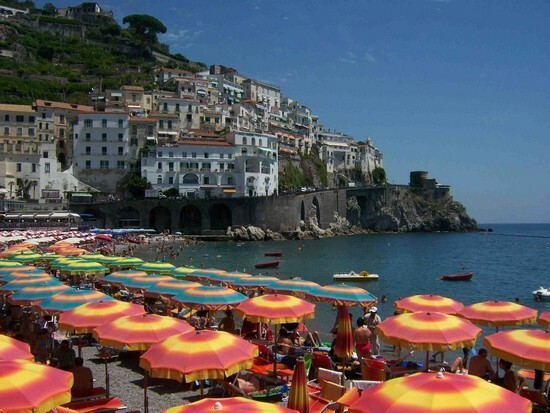 The experience of driving along the famed Amalfi Coast road is one of the thrills of visiting Campania. This tortuously curved and narrow road was an engineering marvel when it was carved out of the rocky cliffs along the entire length of the Amalfi Coast in the mid 19th century. In 1953 the American writer John Steinbeck experienced this famous drive and wrote in his essay called My Positano, “Flaming like a meteor we hit the coast, a road, high, high above the blue sea, that hooked and corkscrewed on the edge of nothing, a road carefully designed to be a little narrower than two cars side by side. And on this road, the buses, the trucks, the motor scooters and the assorted livestock. We didn’t see much of the road. In the back seat my wife and I lay clutched in each other’s arms, weeping hysterically”. 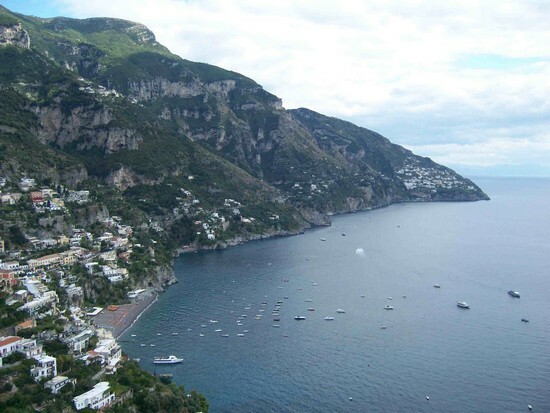 Nearly sixty years later, driving along the Amalfi Coast road offers the same outstanding views of one of Italy’s most picturesque coastlines – and many of the same thrills that shocked the Steinbecks! While not for the faint of heart, the dramatic views from the Amalfi Coast road make it one of the most beautiful drives in the world. The road twists and turns its way from Vietri sul Mare, know as the Gateway to the Amalfi Coast, west along the mountainous coastline to the town of Positano where the road climbs high into the Lattari Mountains, which stretch along the Sorrento Peninsula, to make its way over to the resort town of Sorrento. Along the drive you’ll spot the colorful ceramic tile markers for the S.S. 163, the official name of the Amalfi Coast road, where were made in the famous ceramic town of Vietri sul Mare. The Amalfi Coast road climbs from sea level to very high in the mountains on the coastline, and the way it runs through each little village along the way is unique. When the road was constructed through the village of Atrani, above, it was built right over the front of the town over an arcaded bridge. Over the past 150 years, the town has developed right under the bridge so that the road has become an integral part of the town’s landscape. 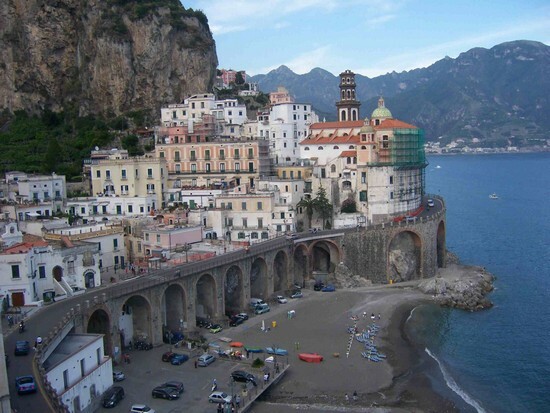 A tunnel was blasted out to connect the road from Atrani to the neighboring town of Amalfi. In Amalfi the drive along the Amalfi Coast road takes you along the Marina Grande beach right on the town’s harbor. It’s one of the most popular places to stop and stretch your legs, explore the medieval town center and visit the beautiful Duomo of Sant’ Andrea. Take a moment to walk along the tree-lined road, which locals called “Lo Stradone,” and imagine the Amalfi Coast as it was for centuries before the road arrived connecting all the villages. From Amalfi the road climbs higher and higher above the sea, winding through the towns of Conca dei Marini, Furore and Praiano. Before long the town of Positano appears along the coastline in the distance. Called the “Vertical City,” Positano is located at the base of a valley and its colorful buildings and houses climb their way up the steep mountainside. The Amalfi Coast road runs through the top of town and to the west offers a gorgeous panoramic view, below, of Positano and the town of Praiano in the distance. 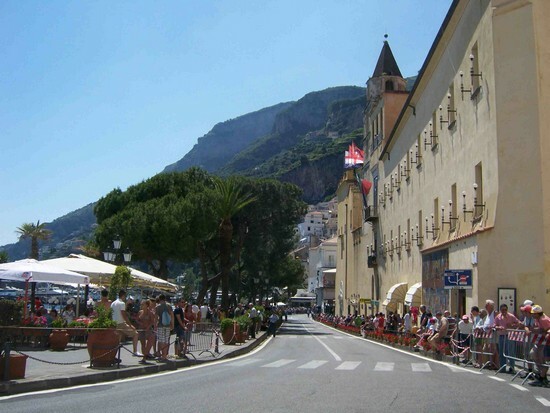 Driving along the Amalfi Coast is an exhilarating and unforgettable experience do to in Italy. The S.S. 163 runs about 36 km (22 miles) from Vietri sul Mare to west of Positano, and the drive takes about 2-3 hours at an easy pace without any stops. The road is quite crowded during the summer months and the month of August, when it is only recommended for experienced or very brave drivers. 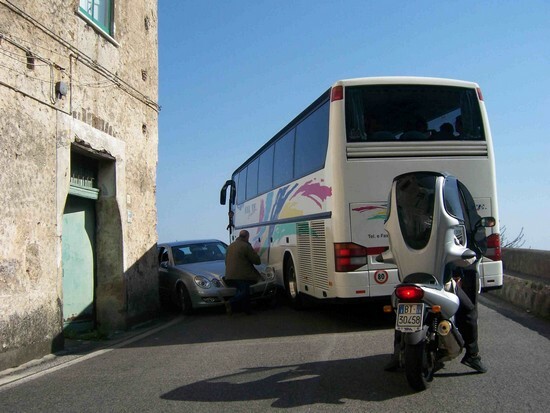 One thing you can expect to see during your drive along the Amalfi Coast are plenty of traffic jams! Steinbeck was certainly right when he described the road filled with buses, trucks and scooters, and you’ll find plenty of seemingly impossible squeezes through tight spaces along the way. 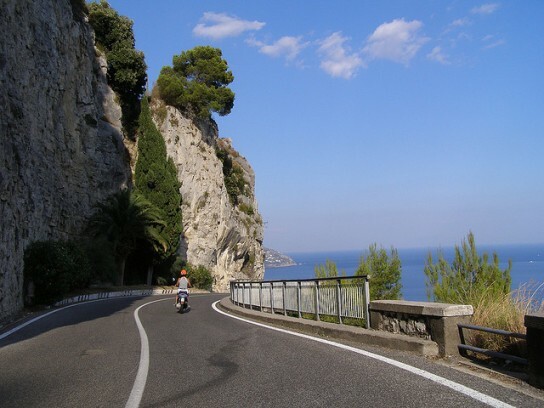 But it’s all a part of the thrill of driving Italy’s Amalfi Coast road. 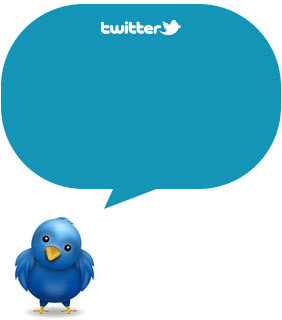 Discover more about Italy and dowload for free our Free Travel Guides!